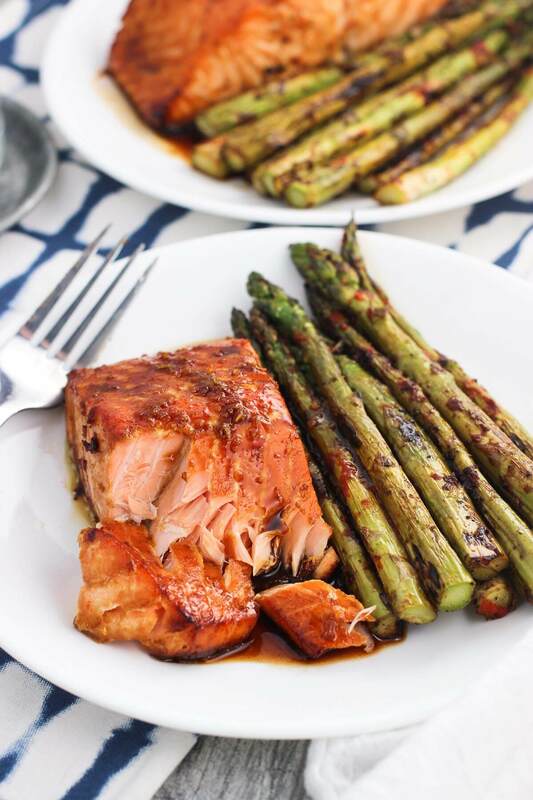 Today I’m excited to share one of my recent favorite dinners – sweet and spicy orange salmon. It’s a healthy dinner idea that is quick and easy. Hi everyone! I’m Alyssa, and I’m popping over from My Sequined Life where I share food and drink recipes that are on the easier and customizable side. There’s nothing worse than coming in the door a little bit hungry after a busy day and having no clue what to prepare for dinner, right? That’s a surefire way to become hangry…and/or reach for the take-out menu. That’s where this sweet and spicy salmon comes in. It’s on the table in about 45 minutes, including the time it takes for a quick marinade! It’s a healthier main dish recipe that fits in wonderfully with any healthy eating intentions you may or may not have made after ringing in the new year. Plus it’s packed full of flavor! The marinade/sauce is made with ingredients that very well may already be in your cabinets and fridge, or you may need to purchase just one or two items. What I love about a few of these ingredients (like sesame oil and sriracha) is that after you buy them once, you’re then ready to go for a ton of recipes that incorporate Asian-inspired flavors. I love the uniqueness they bring to a dish! The level of spiciness is customizable here, so feel free to increase or decrease the sriracha in line with your preferences. The sauce calls for three tablespoons, but since some is discarded with the marinade it isn’t a super spicy dish. As I’m mixing up the marinade ingredients I take a little taste and add more as I go if I’m feeling like something on the spicier side. 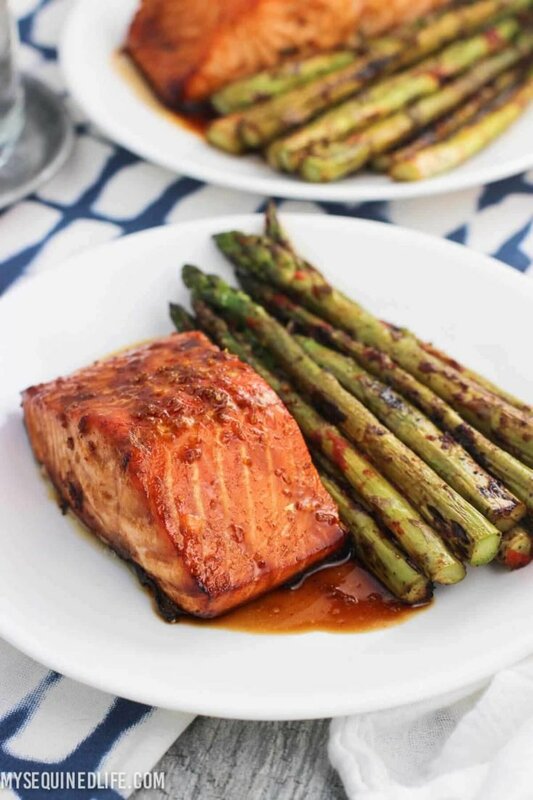 As this sweet and spicy orange salmon was cooking, I made spicy stovetop asparagus as a side dish, which I’ve been pairing with everything lately, but you can serve this salmon with a side salad, on mashed potatoes or rice, etc. This Dill pea and cucumber salad would be especially light and fresh! Have you had tuna cakes? Wait until you try this recipe! Today I’m excited to share one of my recent favorite dinners - sweet and spicy orange salmon. 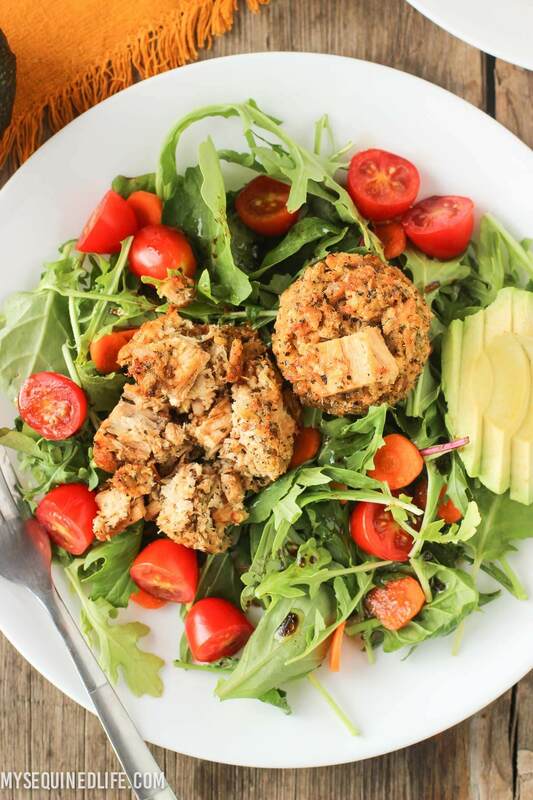 It's a healthy dinner idea that is quick and easy. Whisk together orange juice, orange zest, soy sauce, honey, sesame oil, and sriracha in a bowl. Reserve about 1/4 cup of the sauce in a separate bowl for glazing later on. Add remaining sauce to a shallow dish (or a plastic bag) and place the salmon in it to marinate for about 20 minutes, flipping the salmon over halfway through. As the salmon is marinating, preheat oven to 400 degrees F. You'll want a rack to be situated in the middle of the oven, as well as one near the top. Once the salmon has finished marinating, place the salmon on the prepared sheet, skin side down, and bake on the middle rack for about 18 minutes. After 18 minutes, remove the sheet from the oven and brush the reserved 1/4 cup of sauce over the salmon fillets (see note). Increase oven temperature to 425 degrees F and place sheet on the upper oven rack. Broil for about 2 minutes, or until the edges of the salmon begin to crisp and brown. Sometimes I separate out the reserved 1/4 cup of sauce into two bowls - one for brushing on the salmon before it broils and one for drizzling over the finished dish. The salmon fillets I used were about 1 1/2" thick. If you have thinner fillets, you can reduce the cooking time accordingly. Typically you'll want to cook the fish for about 6 minutes per 1/2".